There's a little Marx in Lennon. Groucho, that is, and maybe a smidge of Harpo. 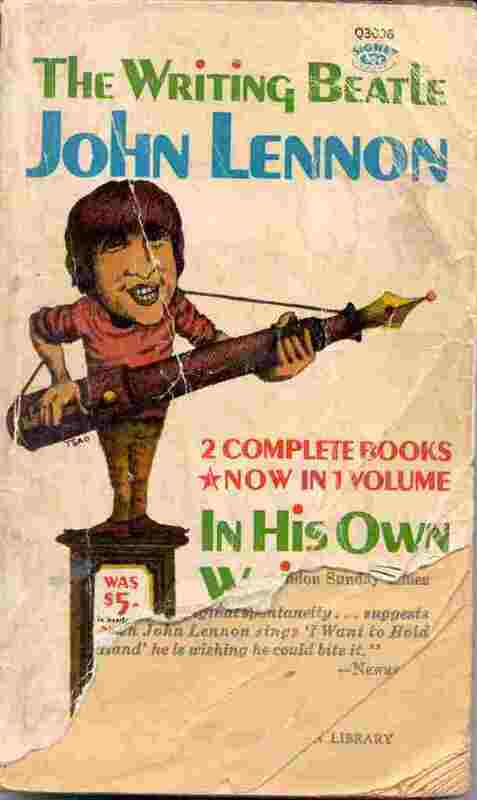 In Lennon, John. That's why I didn't quite know what to make of that séance reported by various News of the Weird stories. For $9.95, the Pay Per View audience could hear what was purportedly John Lennon's voice saying, "Peace... the message is peace." Naturally the reports focused on what Yoko Ono was likely to have thought of it. Tacky, was the consensus. It wasn't clear what aspect of the experience she would find tacky -- the Pay Per View price, the showy supernatural element, the medium’s profit motive, or the message itself. But the televised séance, held in a New York restaurant, was roundly condemned as tacky. Maybe it was the PRAWNS. The prawn amuse-bouche was tacky. Now I think $10 is a good value for contact with someone from the Great Beyond (GB), even if it's just one-way broadcast contact, interrupted by a few 30 second spots for the Ab Lounge (AL). You'd pay -- what? -- $40 to watch a heavyweight boxing championship televised from Las Vegas, even if it only went one or two rounds and no-one lost a portion of his ear in the process. You'd even pay $10 to watch a dreadful Meg Ryan movie or American Pie 7. I have no quarrel with the price; Yoko shouldn't either. And what could be more convenient than Pay Per View? I don't believe Mr. Lennon himself would snub a broadcasted séance as tacky; nor would he view such a media opportunity without assessing its ironic possibilities. As he noted in that oft-cited 1966 interview, the Beatles were indeed "more popular than Jesus," a chance remark that revealed more about his sense of humor than, say, "Give peace a chance." C'mon. We're talking about a viewing audience that would willingly watch Mel Gibson's blood fest, Passion of the Christ on PPV; surely they'd pony up for a long-awaited message from John Lennon, who (in a perverse application of transitivity) must be more popular than Mel Gibson and would no doubt see the fun inherent in this séance. And that's where my credibility is stretched thin. "Peace... the message is peace"? John Lennon was committed to peace, but I don't think he'd take his brief PPV spot and make that statement the centerpiece of his communication from the GB. He'd have some fun with it. 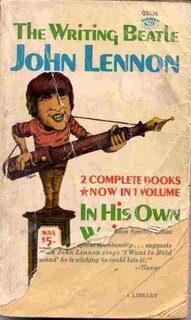 When my brother was very young -- two or three, as I recall -- I taught him to recite one of John Lennon's poems from A Spaniard in the Works. It's one of those things sadistic older siblings do to their younger brothers and sisters, teach them to say precocious things from memory, things that are not wholly appropriate. The older sibling invests the time in this exercise with the understanding that the younger sibling just might take it upon himself to recite the piece, unbidden, in front of the perfect audience of adults. My brother understood the poem well enough to chortle happily as he performed it on cue. 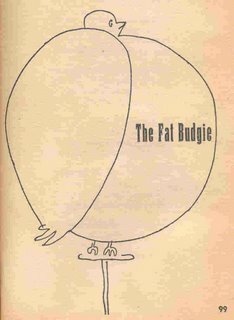 The poem was called The Fat Budgie (p. 99 of my tattered paperback edition "2 COMPLETE BOOKS *NOW IN 1 VOLUME") and it made much better recitation fare than One Fish, Two Fish. Good thing Bukowski was still writing for the LA Free Press, because that would've been fun too. See what I mean? "Peace... The message is peace" just doesn't cut it. It's not what John Lennon would say after 25 years of silence. If the subject were peace, he'd have something caustic to say about Mssrs. Bush and Blair, wouldn't he? He'd speak his piece about the US's threatening stance over Iran's nuclear program (and he'd pronounce "nuclear" correctly, I'm betting). Or maybe he'd say something off-the-wall about religion, informed no doubt by his post-death experiences. He’d make a sly, damning reference to another musician, perhaps Bono or the sanctimonious Mr. McCartney. He would not waste this swell opportunity with a platitude, even a good one. Strange but despite the unknown words i don;t feel that i can;t understand what you are saying. Hi. I like your blog too. Not just for the crustaceans, either. 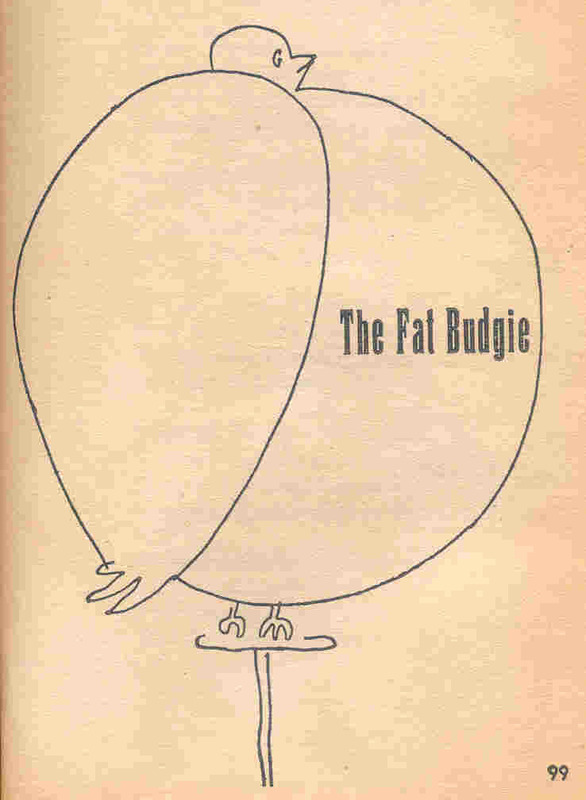 I should note that even when you learn a poem at a tender age, you may not find out what a budgie is until you are an adolescent. I remember Curse You, Big Nose Magnitsky much more vividly than "My Fat Budgie," your readers should note. I'm the budgieman and I love budgies. I have 8 budgies and found the poem very entertaining. Can you tell me where I can get an original copy of the poem. Thank you for a very entertaining post! Nigel, the poem is from John Lennon's book The Writing Beatle, John Lennon: IN HIS OWN WRITE and A SPANIARD IN THE WORKS. Here's the edition I have in paperback. I had no idea it had become valuable.